Eight years ago, Apple revolutionized digital music players with the introduction of the iPod. Originally developed solely as a Mac compatible product, the iPod has since grown to dominate the portable music market. We’ve since gone through countless redesigns, some better than others, and five family branch offs. Now on its sixth generation, the iPod classic is where the story began. The first generation was introduced equipped with a mechanical scroll wheel and 5 gigabytes of storage. Later, the first generation was upgraded to 10 GB of storage. The second generation dropped the mechanical scroll wheel for a touch-sensitive upgrade, capacity upgrades of 10 and 20 GB, and the capability to sync from Windows. iPod Classic 3rd gen moved the physical surrounding buttons above the click wheel for a full touch-sensitive interface. 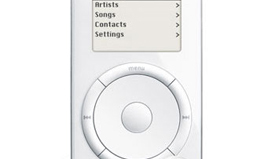 After the release of the iPod Mini, the click wheel with integrated controls was adopted for the Classic’s fourth generation with storage up to 40 GB and charging through USB or FireWire. Apple also introduced a premium model with a color screen for photo viewing named iPod Photo. Naturally, the fifth generation in evolved to play back video on the larger color screen. Finally, we’ve arrived at today’s sixth generation model with up to 160 GB of storage, the largest available iPod on the market. Although only available surviving two iterations, the first generation iPod Mini introduced the click wheel as seen on all iPods today (except the Touch). This first generation was introduced about three years after the classic, sporting a smaller form factor and limited to 4 GB of storage. The second gen was released one year later with vastly higher battery life and a capacity bump to 6 GB. About 6 months after the Mini 2nd gen was introduced, the iPod Nano made its first appearance. It replaced the Mini in the iPod line with 2 and 4 GB capacities. One year later, the second gen Nano brought back the Mini’s aluminum casing and an 8 GB storage option. In 2007, the tall and narrow design was swapped out for a short and fat housing with a 2-inch screen and smaller click wheel capable of video playback. The 4th gen brought back the tall form and large screen with an accelerometer for landscape viewing. Today’s 5th gen model boasts a lower click wheel, making room for a larger screen. It is also the first iPod to include an FM radio, speaker, and pedometer, and video camera. Storage stands at 8 GB and 16 GB options. Before the Mini’s 2nd generation came about, the first gen Shuffle with no screen was released in January of 2005. The 2nd gen Shuffle was given a clip and housed in an aluminum casing. These 1 and 2 GB models stuck around for 3 years, eventually replaced by the current 3rd generation Shuffle. The newest version reverted back to the tall design and all controls were moved from the device itself onto the earbuds. The 3rd gen Shuffle introduced VoiceOver to the iPod line. The newest addition to the iPod family, the Touch stems off from the iPhone line. It was the first iPod with WiFi and multi-touch screen. The device debuted with 8 and 16 GB options, later pushed up to 32 GB. The 2nd generation of the Touch was given a volume rocker, built-in speakers, and Nike+ functionality. The 3rd generation was upgraded internally to match that of the iPhone 3GS’s and storage was pushed to 64 GB. The iPod has come a long way since it’s mechanical wheel back in 2001. Which iPod versions did you own? Is there anyone out there still rocking the 1st gen iPod Classic? Share your thoughts in the comments!